Thinking back, he was just a boy when he served. Sure he was of age to join the Marines, but in reality he was just a boy. He served his country proud, like his father did in World War II and his uncles did in Korea. But, that don’t change the fact that he will always carry with him a piece of the war. His wife was the only person who understood his demons. She had a way about her that would ease his mind and set his demons to rest each night. Now she’s gone and the last two months have been hell. He wishes that she were still beside him, but God had different plans. Night after night, since her funeral, he would lay on the ground beside her grave hoping for some peace. Now he drives all night, battling his demons. He drives until his eye lids are heavier than the M14 rifle he once carried in Vietnam. He then finds a quiet spot, usually a truck stop, and pulls over to sleep. Four hours of sleep is all he can muster, then its back home to start his day. Each night he takes a different route. It doesn’t matter the route, it’s still the same demons he must fight. This night its different. Typically, the heaviness of his eyelids surpasses his need to combat his demons. But not tonight. His normal route will take him within an hour from home. But tonight he has been on the road nearly two hours. Its as if someone else is driving his truck, leading him to where he must go. Out of the corner of his eye he sees a sign. It states “The Highground” four miles ahead. In his mind’s eye he can still hear his Drill Sargent talk about the high ground. He is brought back to reality as he sees the illuminated sign that welcomes visitors to “The Highground.” Something or someone is telling him to pull off the highway. He follows his conscious and drives into the parking lot and parks his truck. Standing tall, in front of him, in all her glory is the United States flag. High up in the sky, she gently rides the warm summer wind. He just sits there, hypnotized by the gentle motions of the flag. He is startled by a gentle tap on his truck window. In a split second, instinct makes him want to grab his rifle. Just as quick, the thought leaves his head as he is brought back to reality. He rolls down his window, thinking that this place is closed and this man outside his truck is going to tell him to leave. “Welcome to The Highground...” gently says the man outside his truck. He puts his truck back in park as he watches the man walk towards the flag pole. Deep within his soul, something or someone is telling him to get out of the truck and follow the man. After careful consideration, he turns off the engine and gets out of the truck. The warm summer wind wraps around him as it welcomes him. Just beyond the flag pole, lining a wide sidewalk he finds the man sitting on a bench staring straight ahead. He knows that stare, its the thousand yard stare that soldiers inherit from being in war. He sits on another bench, opposite of the man. “First time here?” asks the man. He doesn’t respond. Some how it seems that a cat got his tongue. The two men stare each other down, without even seeing each other. The time spent in silence allows him to gather the courage to speak again. “What is this place?” he asks. The man gets up and he follows. The man leads him down a concrete side walk. He passes many statues and monuments. At one point he fears they are going to come to life and kill him. But, his mind is put to ease as he feels a sense of peace come over him. The illuminating sculptures fade into the background as the man leads him down a hill. The man stops. His senses go on high alert as he thinks the man is about to kill him. The man slowly turns and reaches in his pocket to produce a small flash light. He turns the flash light on and hands it to him. “The first time here can be scary. It’s alright. Here take my flash light...” says the man. He takes the small lit flash light. The man stands still as he shines the light around the area. “Where we going?” he asks. The man proceeds to walk to the area. For some unknown reason he follows. A few minutes of walking and the man stops. “This is my favorite place here...” says the man. The man gets down and lays on his back. He just stands there looking down at the man looking up at the night sky. Something is begging him to lie down on the green grass. He picks a spot about five or six feet away from the man and lies down. He feels the warmth of the earth encircle him like a gossamer blanket. For the first time, in as long as he can remember, he is at ease. He awakes to the warmth of the summer sun as it makes it’s way over the horizon. He gets up feeling refreshed. Looking at his watch, he realizes that he has slept for nearly eight hours and it felt good. He looks for the man, but he is already gone. For the first time he sees what he has been lying on. It is a mound in the shape of a dove and he was sleeping, nestled into one of its wings. An eagle flies over head as he makes his way back up to his truck. Once on top of the hill, he sees a gift shop. Although he is eager to get back on the road, his curiosity takes over. Once inside the door, he is greeted by a woman with a gentle smile. In his heart and soul, he thinks that he is in heaven. Just off of Highway 10, deep in the woods in the center of the state, in a field upon a hill, that over looks the pure beauty that Wisconsin is known for - is The Highground Veterans Memorial Park. Before long, a community of volunteers, artists, sculptors along with the help of organizations and contributions created a place known now as The Highground. One of the first things you need to know prior to visiting The Highground is that this Veterans Memorial Park is the only non-government funded Veterans park in the United States. The second thing you need to know is although there are tributes with statutes that honor each of the wars, this Memorial park is not like those found in Washington DC. Once you get pass the tributes and submerse yourself within the park, you will find a community drawn together with the purpose of honoring, healing and teaching. Upon arrival you are greeted by one of the several ‘porch greeters.’ The porch greeters welcome you as if you were a lost loved one as they hand you information about the park. They are also there to answer any questions you may have. One of the first tributes you will see stands high in the sky and that is the American flag with the POW flag just below her. At the the base of the pole you will find the Nurse in all her glory as she pays tribute to all women who served our nation. If you were to fly over The Highground you would notice the plaza, it’s shaped like an arrow head. Wisconsin is rich deep in Native American history and The Highground embraces it to honor all of the Native Americans who served and continue to serve. Just shy of the point you will find a tribute called Fragments. This tribute, three soldiers, honors those who served in Vietnam. The most beautiful part of Fragments is the sound that escapes from the back of the tribute. Hanging under the poncho of one of the soldiers, are bundles of bamboo-shaped bronze rods that are inscribed with the names of Wisconsin’s Vietnam casualties. If you stand at the tip of the arrow head on the plaza and look to your left you will see the Gold Star tribute that honors all those families who lost a loved one in war, but those who patiently waited at home for them, in support. Farther off to the left is the beginning stages of a new tribute being erected called The Boot honoring those who were part of the Persian Gulf wars. Further off to the left is The Doughboy. He waves hello and even says goodbye as he commemorates the World War I heroes. Off to the right, you will see a mound in the shape of a Dove. Visitors are encouraged to lie on the grass among the wings and leave their troubles behind. Further to the right you will find the tribute to our World War II heroes with the WWII Globe. You will also find the WASP, which honors the women who served as Air Force Pilots during WWII. Further to the right is the Meditation Garden, in it’s naturalistic spender it invites visitors to take time to reflect and pray as it can ease one’s pain. Among the gardens you will find The Dove Sculpture and The Fountain of Tears. The Korean War maybe the forgotten war, but not here at The Highground. 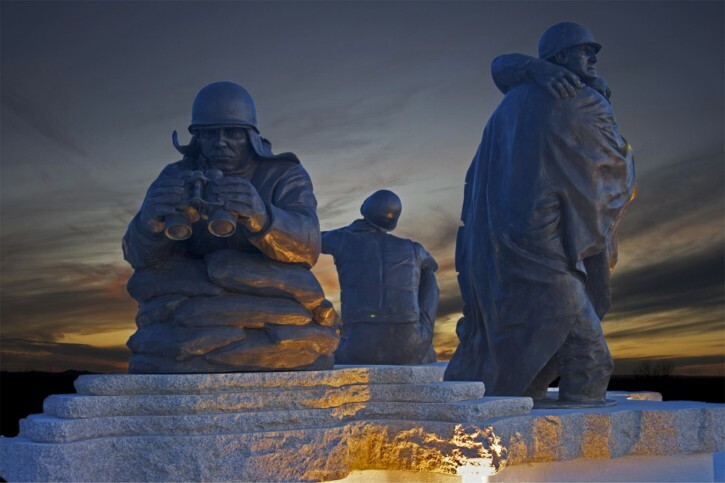 The Korean Tribute tells the story of the Korean War while it honors those who served with three bronze figures. 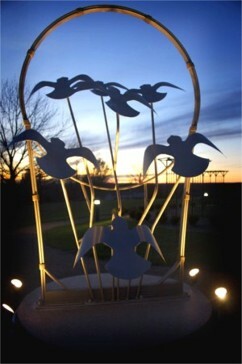 Nearly each tribute contains a Native American influence. However, it all comes together at the National Native American Vietnam Veterans Memorial as it tells their true story of service and sacrifice. All of this is housed on one hundred and forty-six acres of beautiful land. The Highground worked with the Wisconsin Department of Natural Resources to create four miles of hiking trails. These trails snake through the dense Wisconsin forest which can lead you to a treehouse that was built around a 160 year old green ash tree. There are spots along the trail to sit and enjoy the wildlife as you learn about Wisconsin’s nature. Located on the grounds are several areas with picnic tables and shelters just begging you to stay. Before you leave, don’t forget to visit the Learning Center because you never know what you will see and learn there. Don’t forget to visit the gift shop, the volunteer ladies are eager to help you there. One more thing before you go, ring the Liberty Bell. Not once, not twice but three times or more - for it’s because of their sacrifice that we celebrate our liberties. The Highground is not a memorial park to visit just once or twice. It’s a place where strangers, friends, families and even enemies are welcomed with open arms. It’s a place to share, teach and learn. It’s a place to heal. The Highground is a home for those who served, a home for those who patiently waited for their return, and a home that is watched over by the spirits of those who never made it home.